At 15-years-old, all Joseph Charlton wanted to do was play on his high school’s football team. Instead, when his sports physical revealed he had high protein in his kidneys, he heard the words “kidney disease” for the first time. To a teenager who’s got other things on his mind, kidney disease didn’t seem like too big of a deal. When later offered a biopsy of his kidneys, he said, “no thank you,” without thinking twice. “When you’re 15, you don’t care about insulin or high blood pressure,” Joseph reminisced. But by the time he was 30, things took a turn. Joseph said that although his kidney disease was silent and he experienced no symptoms, he had difficulty signing up for health insurance because he had ignored his condition for more than fifteen years. Because of this, he began monitoring his kidneys and meeting with Dr. William Pettus of Nephrology Associates. It was in the last year when his kidney functionality declined to 14-percent that Dr. Pettus referred him to Reach Kidney Care of Middle Tennessee. Joseph said Reach transformed his life. Their use of the latest technology and research, along with the emotional support provided by the staff, changed his whole attitude toward kidney failure. “I went 15 years without taking care of my kidney disease, because I didn’t know I had to pay attention to it. Reach showed me kidney disease is not a death sentence. Reach taught me that it is not as scary as I had made it out to be,” he said. Since his first appointment last March, Joseph has increased his kidney function by 6%. He credits this gain to his Reach Kidney Care support and education. He said the first thing he learned about was how to control his salt and phosphorus intake, and how to reduce his high blood pressure. He learned about the impact of exercise and nutrition, and then about the importance of emotional support. Today, Joseph still doesn’t let his kidney disease hold him back. He works full-time, and since attending Reach, has lost 40 pounds and seen his creatinine level drop from 4.5 to 3.5 in six months. 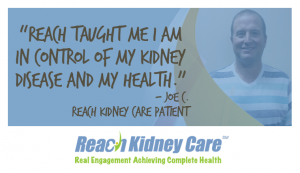 He said Reach’s influence in his life has expanded far beyond kidney care, and because of the program, he realized he’s not just in control of his kidney disease, but of his whole health and wellbeing. “Reach gives hope to the hopeless. I learned kidney disease is controllable. 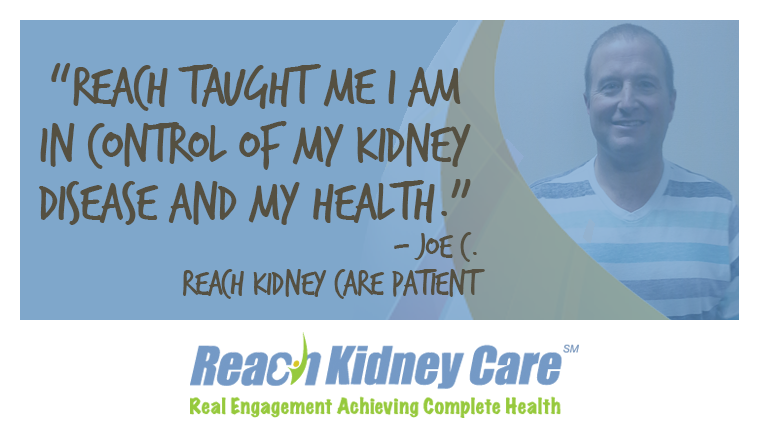 Reach taught me that I am in the driver’s seat with my kidneys and my health,” he said. Recently, Joseph had a fistula placed in his arm, so that when and if he needs dialysis, he is prepared. While discussing his future dialysis treatment options with the surgeon, he surprised the surgeon by explaining how he will be trained to perform home hemodialysis. He said the doctor didn’t believe home hemodialysis would be possible for him. Joseph insisted it was possible, and after looking into it, the surgeon agreed. Joseph joked that he was more knowledgeable than a specialized doctor because of Reach.